By administrator in IMC Exploration Group (IMCP) on 17th February 2016 . Gold prices have dipped today as markets rebound, but this year the precious metal has seen a meteoric rise. 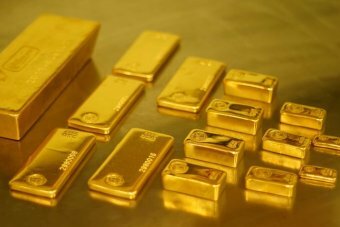 “In US dollar terms the gold price is up around 15 per cent, currently trading around [the] $US1,250 an ounce mark,” said Jordan Eliseo, the chief economist at ABC Bullion. Gold enjoyed the biggest rally in more than seven years last week, rising 5.5 per cent on Thursday alone. 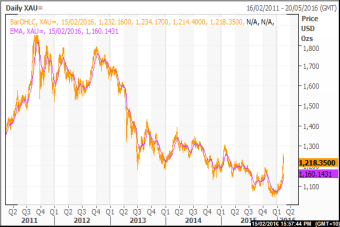 After peaking at almost $US1,900 in 2011 the gold price has been on the slide until this year. “Certainly from a macro perspective, gold is the go-to at this point in time,” said Taylor Collison resources analyst Ryan Armstrong. Central banks are driving a lot of the demand for gold as they diversify away from the US dollar. According to the World Gold Council, banks have bought over 336 tonnes in the second half of last year, an increase of 25 per cent. The US has the biggest reserves at over 8,000 tonnes. However, it is not just central banks buying up gold. China is the largest market for bullion and coins in the world as consumers look for a safe haven due to the weakening yuan. “We’re also seeing institutions and the like starting to adopt gold into their portfolios and in Australia the biggest increase in demand is coming from self-managed super funds,” said Mr Eliseo. Australian mines produce around $15 billion worth of gold each year and the vast majority of it is refined at the Perth Mint.